Millie Girl (my little Yorkie) is afraid to go out of our patio door because of a male goose (gander) who likes to come hissing at her as she tries to enter his territory. Or at least it thinks it is his territory. You see its Canada Goose nesting season. The gander is just trying to protect his female and the nest she is sitting on. Male geese as well as the female are very protective when it comes to their nests and can get quite aggressive if you get too close to it. Check out this video of my husband cutting the grass. You can see the Mama goose on the nest up against the house at the other end. 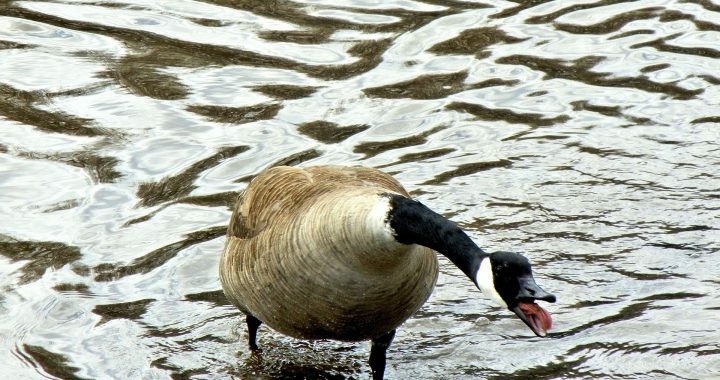 Papa goose is not too happy. A female goose will build a nest practically anywhere she feels is safe to her. That doesn’t necessarily mean it is safe though. Last year there was a goose who tried to build her nest right smack in the middle of everything on my back patio. It didn’t last long as it was not in a safe spot at all. So the goose ended up moving somewhere else nearby where it wouldn’t get disturbed so much. I never got to see where the nest was but goslings did appear some time later and stayed around the pond for a few weeks. The nesting spot this year really isn’t a good one as far as I’m concerned (I really wish it wasn’t in my garden area) but I decided to leave mama and papa do their thing anyway. Besides, once the young hatch all will leave the nest area anyway. Plus, I do like seeing the new babies (goslings) when they are born and watching them grow throughout the summer months. The female goose has been on the nest for about two weeks now. She is the one who incubates the nest while the male stays in close proximity. I have only seen her away from the nest one time in the very beginning when there was maybe one egg, and she was not that far from it feeding in the pond. As soon as she saw me come out the door she hurriedly went back to it all the while hissing at me along with the male. Since then I have not seen her away from it. That is because the female does not eat, drink, or bathe while the eggs are incubating. 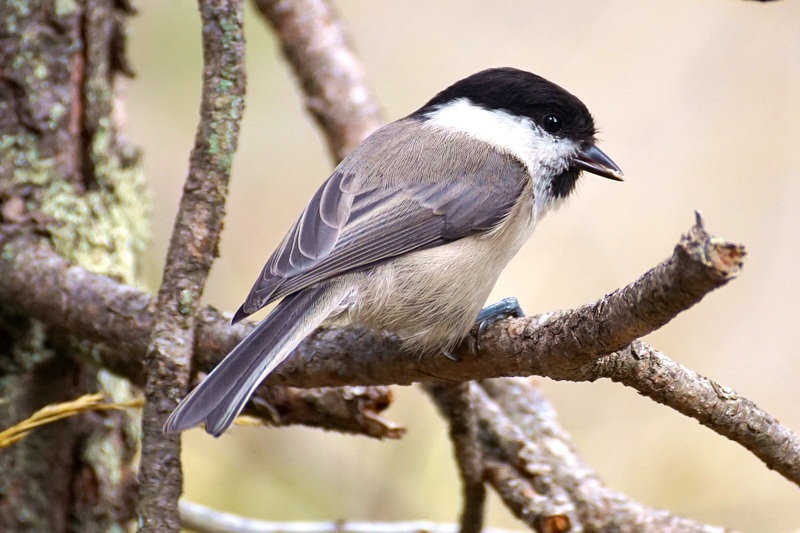 Here’s an interesting fact: The nest is made up of grass and other plant material and is lined with feather down that the female plucks from her body. In about another two weeks the babies will begin to hatch (it takes about 30 days). I am not sure how many eggs there are (one ended up rolling down the hill) but she can lay up to ten or twelve eggs (one a day as it takes that long to lay one.) All will hatch at the same time which takes about three days. Within twenty four hours after hatching the goslings will be led to the water by their parents and be able to feed and swim and even dive up to forty feet after only a day. While moving around the pond and landscape you will see one adult leading the pack with the other at the caboose. 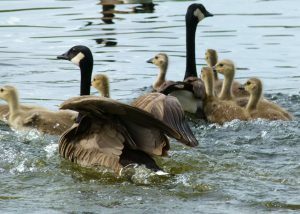 The goslings will not be able to fly until they are about two to three months of age when they get their flight feathers. So they more than likely will be hanging around all summer long here. The family does wander off to other nearby ponds periodically and may not be seen for a few days at a time, but they usually come back. Unless the adults feel that another pond is safer and/or is a more favorable feeding area, they may stay there. That is okay with me as once the young start to grow they like to linger too close to the street and sometimes get killed. Not a pretty sight. And….then there is the goose poop all over my yard. Not good! The young will stay with their family group until the following spring. 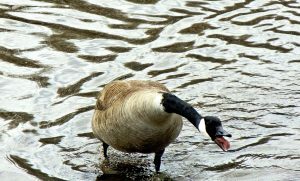 Canada Geese can be found on and near lakes, rivers, ponds, in farm fields, backyards, golf courses, park lawns, and even large parking lots. They feed on grasses, grains, corn, wheat, soybeans, seeds, berries, plant roots, and aquatic plants. They will also eat fish and insects. It is definitely nesting season for the Canada Geese. 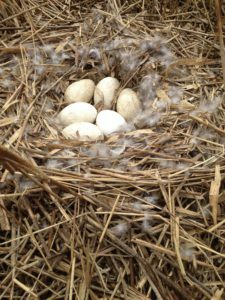 Take a look around the next time you are near a pond, lake, or even a parking lot and you will see a female goose either sitting on a nest or the gander wandering around close by. Canada Geese do not really care where they build their nest as long as they think that it is safe for them. Sometimes they can be in the most unusual places and so be aware if you see geese present because if they feel that you are getting too close to their nesting area you will probably get harassed just like in the case of my husband. Posted in Backyard Birds, Ducks, Geese, Shorebirds and tagged canada goose, gander, geese, goslings.